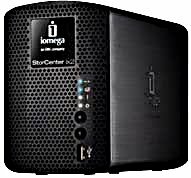 Iomega - 34481 Iomega StorCenter NAS ix2-200 - NAS server 2 x 1TB SATA II Drives. Desktop Data Storage Solution. New / Factory Warranty.